South Bimini, Bahamas – The Blue Flag officially flies over Bimini Sands Marina, making it one of only four marinas in The Bahamas – and the only marina on Bimini – to have earned this prestigious environmental emblem. Presented by the Foundation for Environmental Education (FEE), an international nonprofit and non-governmental organization, the Blue Flag is the highest award a marina can attain for environmental stewardship, education and safety. Bimini Sands Marina received its Blue Flag certification in September 2013 after a rigorous application and inspection process. 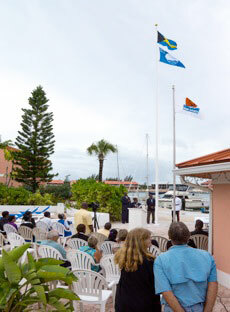 The Blue Flag-raising ceremony, held at Bimini Sands Resort & Marina in January, was attended by some of The Bahamas’ top dignitaries including Earlston McPhee, Director of Sustainable Tourism in the Ministry of Tourism, who was the guest speaker. Also attending were Prescott Young, Head of Bimini Ministry of Tourism; Casuarina McKinney-Lambert, Executive Director of Bahamas Reef Environment Educational Foundation (BREEF); Oscar Monroe, Bimini Island Administrator, and members of the Royal Bahamas Police Force. The Blue Flag is a voluntary “eco-label” that is awarded to marinas around the world based on their compliance with 24 criteria covering Environmental Education & Information, Water Quality, Environmental Management,Blue Flag Marina Logo 2 Safety and Services. The Blue Flag has been awarded to select beaches and marinas in 48 countries across Europe, South Africa, Morocco, Tunisia, New Zealand, Brazil, Canada and the Caribbean. In addition to earning a Blue Flag, Bimini Sands Marina was the first marina in the world to become a certified Shark-Free Marina, aiding in the preservation of endangered shark species. Bimini Sands also offers a wide range of eco-tours including scuba diving; snorkeling excursions; kayak, paddleboard & boat rentals; wild dolphin swims; stingray feeds; shark encounters, and more. Offering the fastest and easiest access to the Gulf Stream of any marina in the Bimini Islands, Bimini Sands Marina is open year-round. This protected marina, which maintains a depth of 9 feet in mean low water, features Bellingham concrete floating docks accommodating vessels up to 115 feet in length. The many amenities offered by Bimini Sands Marina include a fuel dock with gas and diesel, customs on-site on peak weekends, 30/50 amp shore power, free WiFi, a ship’s store with ice, bait and supplies, showers & laundry facilities. The Petite Conch restaurant, which overlooks the marina, serves tasty island fare, and a free shuttle bus takes guests to the Beach Club property, featuring the Bimini Twist Restaurant and Mackey’s Sand Bar, as well as another pool. Fully furnished condo accommodations on the marina or the beach are available, and there are two freshwater swimming pools and a tennis court on the property.